BY JANUARY 1885, the work of shipping the statue to America was completed. Each piece was classified and marked so that it could be reassembled on Bedloe's Island with accuracy and efficiency. The pieces were packed in 214 specially constructed cases which, when filled, varied in weight from a few hundred pounds to several tons. The French Government supplied a vessel, the Isere, in which to transport the statue to the United States. The Isere left Rouen on May 21, 1885, and arrived at Sandy Hook, at the entrance of New York Harbor, on June 17. After the title papers to the statue had been transferred to General Stone, the vessel was docked at Bedloe's Island. The Statue of Liberty Enlightening the World was dedicated October 28, 1886. Count de Lesseps and Senator Evarts were among the speakers. 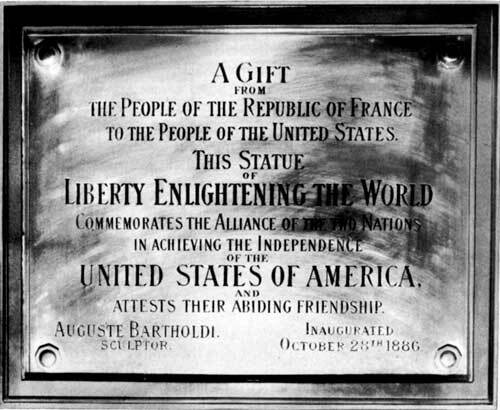 Bartholdi, in the torch some 300 feet above, pulled the rope that removed the French tricolor from Liberty's face. Then, President Grover Cleveland accepted the statue on behalf of the United States. Especially impressive were these words of his: "We will not forget that Liberty has here made her home; nor shall her chosen altar be neglected."